Every time I go out to the garden there are new surprises. I think I give it a good once over every day, looking in all the nooks and crannies for new produce popping up and I still miss things. This evening the dogs and I drove down to check the mail box. They look forward to going with me every day. Believe me when I say, there is nothing like hot dog breath on the back of your neck on a summers day. We have to go about a mile down the road because the post office will not deliver to the end of our driveway. That’s another story. As I drive out I always slow to a snails pace to ogle the garden before I reach the end of our lane. 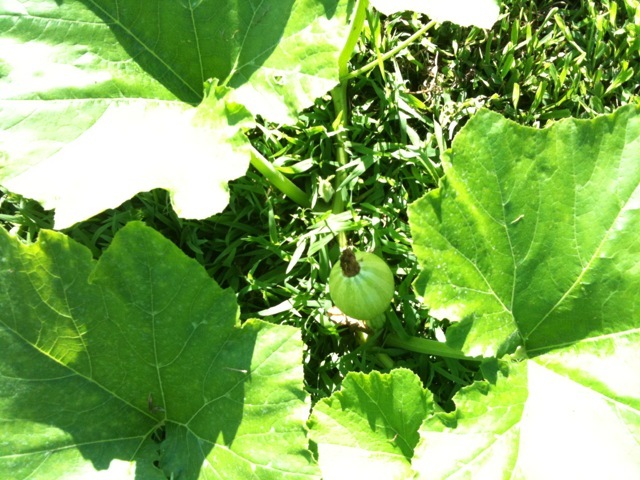 Today I was surprised to see a miniature, green, baby pumpkin hanging from a vine. I stopped for a closer inspection and found another one further down the fence line. I was excited to see the little bulbous gourds. I know they weren’t there yesterday. 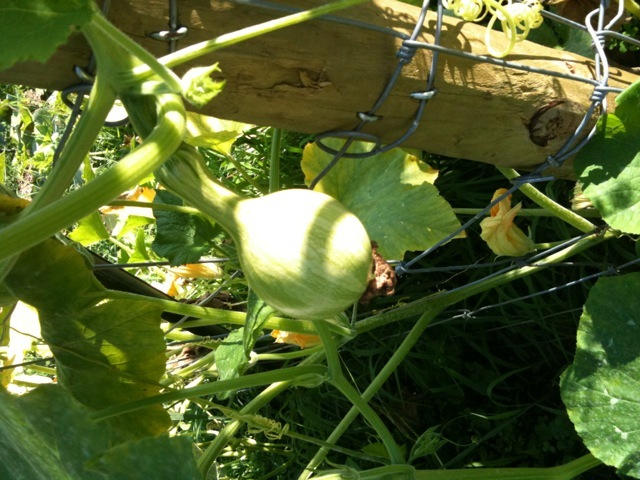 Unfortunately the vines want climb the fence and these pumpkins are hanging on the outside. Perfect for the dining pleasure of deer or any other critter that wants to stop by for a snack. You can’t move the vines. If you do you will break the runners or clinging vines and the plant will die. Hopefully the little pumpkins will make it to adulthood. I think Sonny would be real upset if we don’t get pumpkins for pumpkin pie. I can see that pouty face now. I don’t think I could bear that, so let’s hope there are others hiding on the inside of the fence, either that or I will have to buy Libby’s canned pumpkin from the store. Finally a day that is not so hot and humid that you melt like an ice cream cone in a little kids hand. The storm we had yesterday cooled things off for the time being, but the force of the wind and rain blew over the tomato plant cages. Hopefully the fruit has not been overly bruised. I was barely able to push the cage prongs back down into the ground. The plants are loaded with green tomatoes and are heavy and cumbersome to deal with. I’m afraid I will need Sonny’s braun to properly set them. The lesson learned is that next year we need to use something better than cages and twine to support the plants. On the upside I was able to pick one Big Boy tomato and six plum tomatoes. They look pretty good considering they were at the bottom of the plants and were somewhat squashed when the cage toppled over. The string beans looked pretty pathetic today too. The hard rains beat them to death, but I think they will survive. I also plan to plant another variety next year. These are called Tender Pods and if anyone has a suggestion on a better variety we would appreciate the comment. Preferably a stringless one. A few years ago Sonny and I planted string beans and they were like chewing hemp rope even after we pulled the strings off. We tried picking them at younger and younger stages, but to no avail. I don’t even think a goat could have chewed those things up. If we tied them together I believe we could have made a hammock. 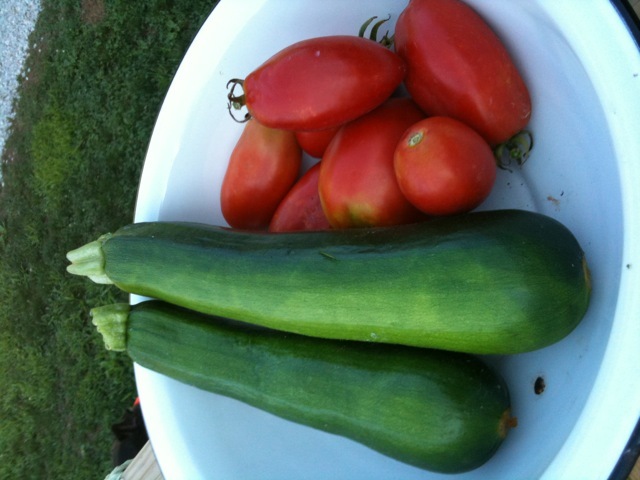 I checked the zucchini today also and found two nice sized ones. They were perfect in every way. No matter how many times you check the plant you are bound to miss one. There is always one hiding in the undergrowth. 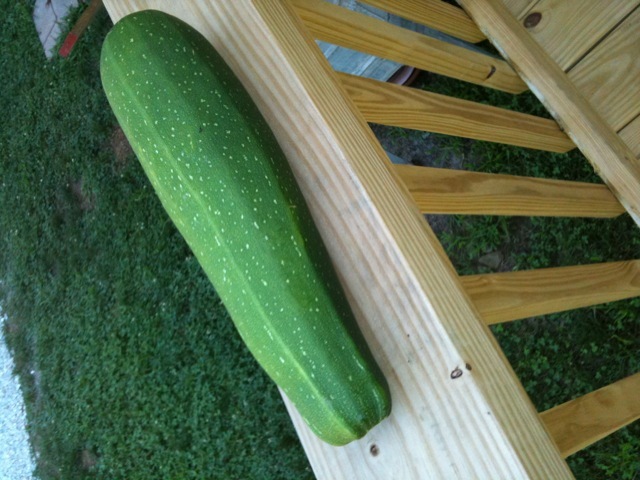 It becomes a mutant zucchini, large enough and heavy enough to use as a club. They are frightening when you come upon them. If left to their own devices they would gobble up the smaller ones and rampage the garden. Well, I guess if they can have an Attack of the Killer Tomatoes movie they could have one of the Killer Zucchinis. Sleep tight tonight, lock your windows and doors. It’s out there, waiting. Yesterday was a scorcher, and hard rains with thunderstorms were expected for today, so Sonny and I thought we better get our onions and potatoes harvested while the sun was shining. The tops of the potato plants were beginning to turn brown and the onion tops were already dry and laying on the ground. Those are sure signs that they were ready to be dug. We got up early yesterday morning before the weather turned into a pressure cooker and grabbed up the spade fork and a bushel basket. The ground was still a little moist. It was easy for Sonny to use the spade fork to push up the potatoes while I pulled the plants out of the ground. We were excited to see a bunch of dirt covered tubers hanging from the bottom of the each plant. For weeks we have wondered what we would find, whether they would be a good crop or rotten or blighted. Since this is our first garden here and we didn’t have time last fall to plow and fertilize and we weren’t sure how things would grow. 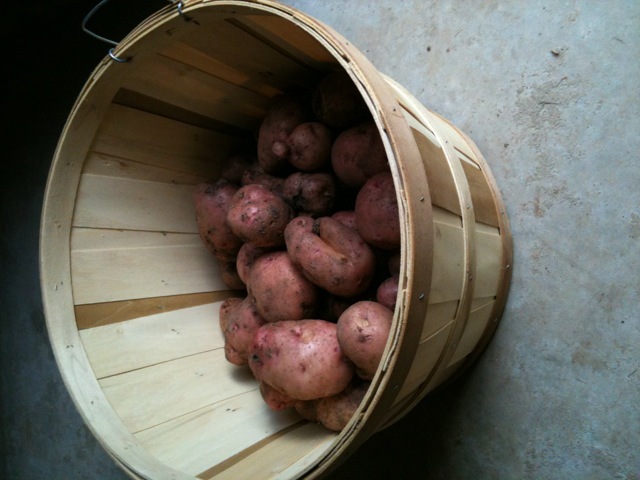 We harvested a little less than a half a bushel of red potatoes in various sizes. Some had to be thrown away because of bad spots, some were perfect and others had a few bad spots but will be usable. Not bad for our first year. The yellow onions were easy to pull out of the ground. They were fairly small in size and probably came to approximately three pounds. We spread them out on an old window screen and placed them in the sun to dry for about a day. Then we will hang them to cure. They will get the dry papery skin that you see on the onions you buy at the store. We also pulled up the rest of the green cabbage. We were not impressed with the cabbage. It was ok but had a few too many worm holes. It is still edible, but I don’t know if I will grow any next year. We did a few more chores around the farm then got ourselves cleaned up and went to town to do some shopping and see a movie where we could hide in air conditioning until the slightly cooler air of evening. Our redheaded girls are growing into young ladies. 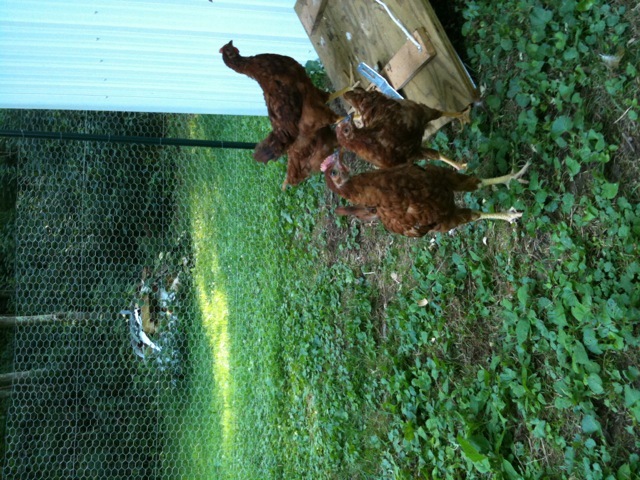 Their combs and waddles are beginning to bloom and their tail feathers are starting to lengthen and fan out. Like most adolescent girls they are starting to preen themselves, stretching their wings and showing off their long legs. Unfortunately they have the attitude of the Wives of Orange County or the Jersey Shore Girls. If we could speak chicken I believe we would hear a lot of gossip in the coop and I’m sure most of it isn’t nice. Feathers become ruffled and ultimately a showdown ensues. It only lasts a second and I guess they are trying to figure out the pecking order. They absolutely do not like to be told what to do. If you open the hatch to let them out in the morning they don’t want out. At night it’s all on their terms. If you try to get them in one second early it ain’t happnin. 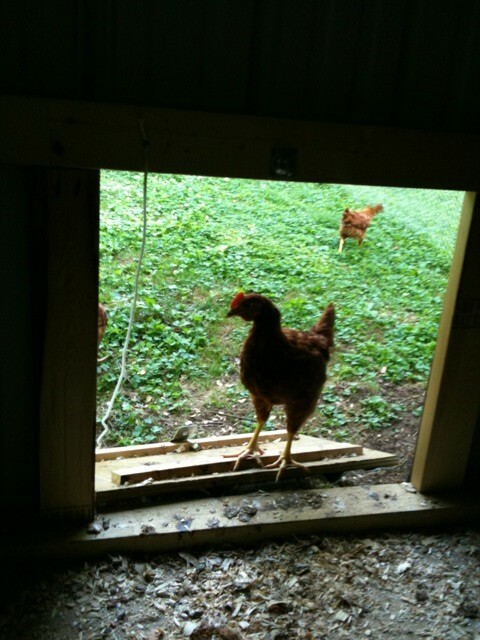 We don’t have a gate on the fence so we have to go around to the main door of the coop, enter it and close the hatch. If you shew them inside the coop, by the time you get around and enter the main door they’ve skittered outside again. They are always attempting to dodge curfew, unless you come out when it’s already dark and they’re all tucked in beddybye. Ah, nothing like Smart Alec teenagers. They do like us though when we bring them some nice juicy bugs. I guess that’s equivalent to taking them to the mall. I believe I mentioned in a previous blog that Ruby was going to have a new buddy. He’s a year old brindle pit bull named Shiner. Here is his story. About eight months ago a young woman brought a little pit bull pup into the Veterinary Clinic where my daughter-in-law volunteers. She brought him in to get his vaccinations and asked if they knew of any one who would like to give the pup a home. She was at her wits end as her husband had just received orders to San Diego, California where pit bulls are banned. She had tried to find a home for him, but time was getting short. Her last resort was to send him to the animal shelter where they promptly told her that they would put him down the moment she walked out of the door. My daughter-in-law told her not to get her hopes up but maybe her in-laws would take him. She called the animal shelter to verify the ladies story and she got the same answer. To tell you the truth I wasn’t sure if I wanted a male dog. I have always had females. I wasn’t even sure if a pit could be a good farm dog. They like to chase everything. I know because we have had them before, but despite that they were wonderful dogs. Sonny and I discussed it and I could not allow this little pup to be destroyed without having a chance. Every dejected, misfit animal seems to find my door. It took months before my son and his wife could get Shiner to us. By the way, my son named him Shiner and I figured out later that it is a Texas beer. They got him vaccinated and neutered him and taught him some manners. Ruby loved her new buddy the moment he arrived. They have become best friends. Shiner is a great dog. He is submissive and sensitive, likes attention and gives a lot of love. He knows he is the last man on the totem pole of the pack and I will keep it that way. Ruby is fed first, comes in the door first and gets cookies first. It is discipline. We have had him a month now and he is learning the rules pretty well. We have introduced him to the chickens but he knows he must stay back from the fence. He is learning to come when I call him and to stay close by, but he is a little hard headed. There have been a few puppy incidents but that’s to be expected. He’s just a year old and has a lot to learn. He’s a good boy and we already love him. As for becoming a good farm dog? I think it’s possible, but not without a lot of trials, as it would be with most any dog. A note on Ruby. She showed us this weekend how she has grown into a wonderful dog and has overcome her past. We took her to a rabies clinic to get her shots updated. A rabies clinic is done in a lot of towns where a vet comes out to a location to give shots at a discounted price. It helps those who wouldn’t normally take their pets to a vet. Anyway there are all kinds of people and pets waiting in a line to get shots. People are talking and dogs are barking and excited. 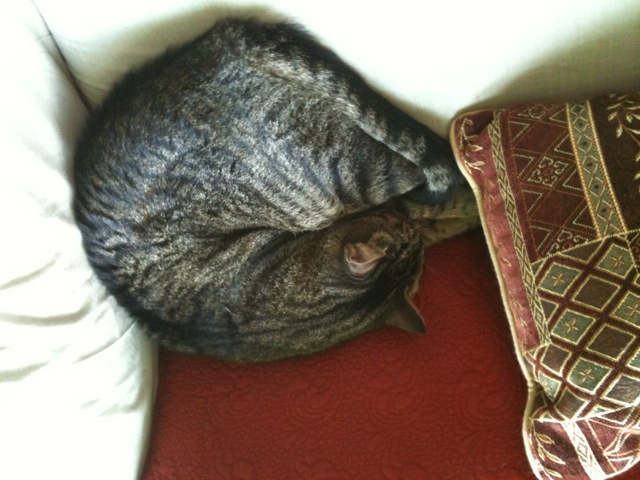 I thought Ruby would be frantic, panting nervously with her tail tucked between her legs. I couldn’t have been more wrong. She was the best behaved dog there. No barking, friendly, and calm as a cucumber. It just shows how with a lot of time and work a dog who was deemed useless, and unwanted could become the best dog in the world. I think it only right that Shiner be given the same chance. There are a lot of good dogs out there hidden under layers of dejection, rejection, and mistreatment. Some are deemed unworthy of life just because of their breed. All are thrown into a group. The animal shelters are full of unwanted dogs. If you think you want a dog check there first or check out the rescue organizations, and be sure to spay or neuter your pets. 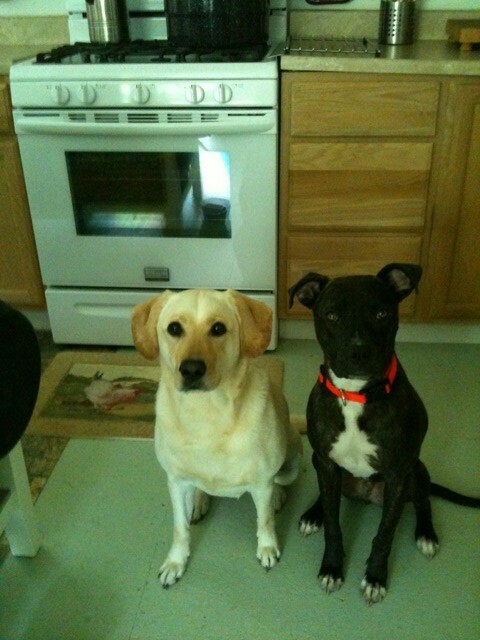 I don’t know about anyone else, but our dogs are great company and I don’t know what I would do without them. They are part of the family. We are a pack. 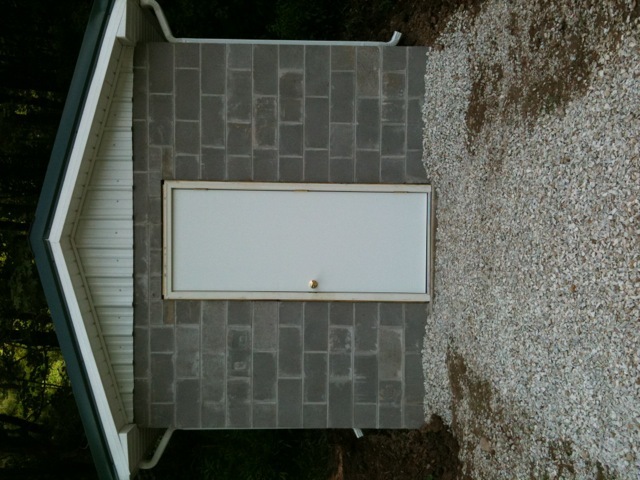 The root cellar build is finally completed. Ronald, Vickie, and their grandson Paul came early this morning to put the final pieces of the root cellar together. They installed R19 insulation batting in the rafters and then covered it with sheeting to make the ceiling. Then they put on the roof vent and gutters. 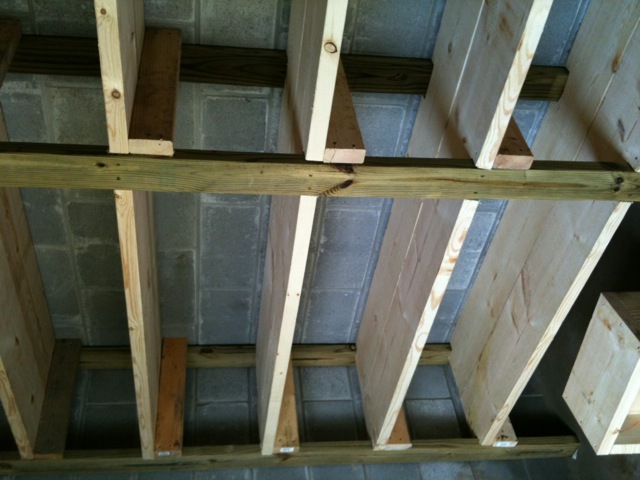 Ronald built five rows of 19″ wide shelves with 14″ spacing between the shelves. That will leave enough room to stack two quart jars on top of each other if I need to. It’s a bit intimidating to look at all that shelving and wonder if I will be able to can enough stuff to fill them. I think my few jars of pickles and conserve are going to look lost in there right now. Ronald who is forever thoughtful, built me two step stools from leftover lumber so I will be able to reach the top shelves. It will make it a whole lot easier than trying to climb the shelves like a monkey. I think I might be too old for that anyway. Might break a hip or something. Last but not least the door was installed. Now it actually looks like a building instead of a tomb. The only thing Sonny and I will have to do is paint the ceiling and and the outside block. Oh, and can, can,can….and hope and pray that our potatoes, sweet potatoes, and pumpkins do well. I think the completion of the root cellar was a little bitter sweet for Ronald. After all, it was him who has overseen and built every building on this property. Don’t worry Ronald, you don’t know it yet, but I have a few more projects up my sleeve. You are currently browsing the Off-Grid in West Virginia blog archives for July, 2010.